I definitely feel like we’ve talked about Giratina a lot lately. Maybe it’s cause he keeps getting interesting cards that shape up certain decks or something. Kinda like what today’s card does. Giratina is a Basic Psychic Pokemon, 130 HP, with a Darkness Weakness, a Fighting Resistance, and a Retreat Cost of 3. The main appeal is on Distortion Door, which is an Ability that lets Giratina come back from the discard pile if he’s there, and if you do, you get to put a damage counter on 2 of your opponent’s Benched Pokemon. Shadow Impact then is a 3-for-130 that puts 4 damage counters on your own Pokemon. On the one hand, I get it, he’s effectively a free Pokemon and free damage if you put him into the discard pile with things like Sightseer from yesterday or something like that. And as we all know by now, it’s those little bits of damage that add up over time. More Giratinas puts more damage out and about, and that brings a level of impact over time as well. On the other hand, Shadow Impact is an okay attack, but those 4 damage counters – effectively 40 damage – that get placed on your Pokemon – that’s all on one Pokemon, by the way – is a tremendous setback for the move, and it doesn’t prompt you to bring Giratina out that often to power him up. But then at that point…how are you getting him off of your Bench? In Expanded, there’s one obvious answer in the form of M Gardevoir-EX (STS), whose Despair Ray discards Pokemon from your Bench for massive damage. Put Giratinas into the discard pile not only allows for multiple revives to allow for lots of damage to get spread around, but then they can get immediately discarded again for the Despair Ray, adding upwards of 30-40 damage to the attack while spread out about twice as much, depending on your Bench space and how many Giratina you bring back. Needless to say, it’s a great boon for that deck! But in Standard, I must be a little blind to figure out why bringing Giratina back benefits you, outside of the obvious damage perks. Maybe you can bounce him back with something or discard him with another move, I don’t know, but I do know that Giratina is a major card of the set for one reason or another. At least that’s what everyone else is telling me. Arora Notealus: Again, another interesting concept, but there’s only certain interactions that really help Giratina to come to fruition here. I’m sure the other guys will have noted some interactions in Standard at least to showcase why he’s so great, and I’ll be looking forward to educating myself off of them. Take that as a lesson in why having multiple reviewers across not only this site but a wide variety of sites and sources is great! Next Time: From the depths of the earth rising up…back on the streets. Giratina has some features that certain decks would love to take advantage of. For starters, it is a Basic Psychic Type with 130 HP, weak to Dark, resist Fighting, and a retreat cost of three. Shadow Impact does 130 for PPC, and puts 4 damage counters on one of your Pokemon. This isn’t the kind of attack that you’ll continue using despite the potential to 2HKO and easily being fueled up by Malamar. But maybe you want to damage your own Giratina, so that you can have it KOed easily and activate its ability if it’s in the discard pile. Even if Giratina can’t make use of this attack, it can simply be a bench sitter racking up damage output for attacks that depend on the quantity of your Pokémon in play. The ability is why Giratina will see a lot of use of. Distortion Door states that if this Pokemon is in your discard pile, you can put it onto your Bench. Then put 1 damage counters on 2 of your opponent’s Benched Pokemon. This ability invites combos for other cards such as doing spread damage to your opponent’s Pokemon if there’s any damage counters on it. This ability stacks, so if you have room to put 4 Giratina on the Bench, then you get to use this ability four times! One damage counter might not seem much, but even that can matter! What would’ve been nice is if you got a way to discard Giratina from play into the discard so that you can use the ability. Hydreigon from crimson invasion comes close; with a full Bench, you can discard Benched Pokemon until you have three Benched Pokemon left. Meaning you can discard two Giratina at best, which is still better than nothing. Except Hydreigon is not as competitive. Expanded has Sky Field, and that greatly increase Bench size as well as helping you discard three (or five if you use Parallel City) Pokemon, so that you can repeat Giratina’s ability once more! Giratina (LOT 97) returns to the Pokemon Trading Card Game in the Lost Thunder expansion pack. This card from Lost Thunder actually looks like it will see more play than the Prism version that came out from Ultra Prism because of its ability Distortion Door. You see, Distortion Door allows Giratina to pull itself up and out of the discard pile and put itself back on your bench. And if that’s not a good enough ability, when it executes that functionality, it puts one damage counter on two of your opponent’s Pokemon. Wow! That’s a fantastic ability… if only there were a way to be able to repeat it over and over again, especially without having to get Giratina KO’d to execute it. And that’s what Cofagrigus (LOT 100) comes in. Its attack Spirit Juggling discards Pokemon from your bench… and man is that a great combo. It took me a few games to figure out the rhythm of this deck and some of its inherent liabilities (like making sure you have three Cofagrigus in play after attacking if your main Cofagrigus in the active is damaged, you only have one Yamask on the bench, and you’re going up against Fairy Ninetales), but I wound up going 13 W 8 L with it. However, I made a number of mind bogglingly dumb mistakes in a couple of games that I’m sure cost me the match, so I feel that it’s at least two or three wins better than that 13 W 8 L record. Here’s the list I used and a video of a few matches. The matches themselves weren’t spectacular, but they do have moments where the deck really shows why it might just be top tier material. At the very least, it’s fun to play and will most probably win you some matches on the ladder. Giratina might be its own build too and might have functionality in spread archetypes or Malamar builds. Its attack does 130 damage (but forces you to put 40 damage on one of your benched Pokemon) and costs two Psychic and a Colorless, but that’s not terrible in a squids deck. It’s also weak to Dark, which might be bad IRL, but Zoroark’s gone MIA from PTCGO. In 57 matches so fat this month, I’ve only seen Zoroark GX three times. How crazy is that? Welcome to our 10th place selection as we countdown our Top 11 Picks from SM – Lost Thunder. If you’re new to our Card of the Days, you can read an explanation of the process here; if you’re familiar with it but skipped yesterday, we’re doing things slightly different this time for “reasons”. So what would normally have only just made the list is Giratina (SM – Lost Thunder 97/214; SM – Black Star Promos SM151). Huh, good thing we did do our 11th place pick yesterday, or else I might think I’d forgotten it was a countdown and started with our top pick. That… might not be a bad idea to shake things up in the future. I’ll have to run that by our esteemed Pojosama. So, why do I think Giratina is so good it ought to top our list? Giratina is a Basic [P] Pokémon with 130 HP, [D] Weakness, [F] Resistance, [CCC] Retreat Cost, the Ability “Distortion Door”, and the attack “Shadow Impact”. 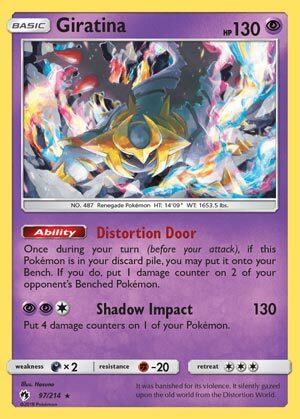 Distortion Door is one of a handful of Abilities you activate when the card is in the discard pile; when you do, Distortion Door Benches the Giratina in question directly from your discard pile, then has you place one damage counter on two of your opponent’s Pokémon. The effects are intertwined; you can’t place the damage counters without Benching Giratina via Distortion Door, and you can’t Bench Giratina via Distortion Door unless you attempt to place the damage counters after, barring something external interfering with the process, like an opponent lacking a Bench. You cannot place two damage counters on a single Benched Pokémon, either. Speaking of placing damage counters, Shadow Impact costs [PPC] to use and does 130 damage, but also places four damage counters on one of your own Pokémon. 130 for three, even when it isn’t all [C] Energy requirements, is good; having to place damage counters on your own Pokémon is usually not. Fortunately, you may be able to place them somewhere at least relatively inconsequential, or even someplace they can eventually do you some good via the correct combo. Your opponent will have a turn to take advantage of them, however, before you’ll have a chance to use the vast majority of healing effects to remove them. Why do I think this is so great? Let us count the ways. Being a Basic is the best Stage right now, though Distortion Door might arguably be an even better Ability if it was found on an Evolution. Being a [P] Type is useful for exploiting Weakness right now, though the damage output is high enough that the bottom half of [P] Weak targets would be taken out regardless of Weakness. The Typing is also advantageous due to Type-based support, with even more of it available in Expanded than Standard. The HP isn’t the maximum printed for a Pokémon of this Stage, but it is still high enough where a OHKO is a (just barely) less likely than more likely. [F] Resistance is handy because the metagame currently favors some good to great [F] Type attackers like Buzzwole. Distortion Door allows Giratina to serve as discard fodder without actually being “wasted” by it, and similarly lets it recycle itself should it be KO’d. The damage counters can either set-up for a pseudo-OHKO, finish off nearly KO’d targets on the Bench, set up for damage counter moving combos, or (used in multiples) KO smaller targets without them ever having been attacked! Shadow Impact has a very good damage-to-Energy ratio. Yes, there are drawbacks to this card. [D] Weakness is pretty dangerous right now, though Zoroark-GX – the most prominent [D] attacker in Expanded or Standard – just saves itself needing a small boost as it typically swings for 120 with its “Riotous Beating” attack. The Retreat Cost means you’ll either need it to serve a purpose while Active or pack something to help it vacate the position because manually Retreating is a pain. Though unlikely, there might be a silver lining to the situation as it does allow Giratina to be searched out by Heavy Ball. While there are cards that can take advantage of damage counters on them, four damage counters worth of “recoil” from Shadow Impact really can be a problem. When you put it all together, though, you get a card with decks waiting to run Giratina. This is the new preferred single-Prize attacker for Malamar (SM – Forbidden Light 51/131; SM – Black Star Promos SM117) decks. Malamar decks already tend to run higher on effects which discard because they compliment Malamar’s “Psychic Recharge” Ability, and said Ability makes fueling Shadow Impact easy. I am still uncertain where one could truly safely place Shadow Impacts damage counters without risk, but if you’re throwing Giratina at Pokémon capable of OHKOing it anyway, it won’t make much difference just placing them on the attacking Giratina itself. Giratina is the new, preferred Bench-fodder for any deck that needs to fill its Bench, but especially if the strategy is prone to discarding Pokémon from its own Bench. Use Giratina to boost the damage output of Zoroark-GX’s Riotus beating both through the attack’s own effect and through Distortion Door’s damage counter placement softening up attack targets. In Expanded, Battle Compressor effectively becomes search for Giratina, and your opponent discarding Sky Field just means you revive your Giratina as soon as your next copy of Sky Field hits the field… and you enjoy another wave of damage counters being spread about! M Gardevoir-EX (XY – Steam Siege 79/114, 112/114) can use its “Despair Ray” attack over and over again, discarding Giratina to hit harder before using Distortion Door to recycle them over and over again… while spreading damage counters. Don’t play Expanded or don’t like using Mega Evolutions? Cofagrigus (SM – Lost Thunder 100/214) has the attack “Spirit Juggling” which works the same as Despair Ray, except the base damage is lower while the damage from each Pokémon discarded is higher. Just about any deck that can spare the Bench space and doesn’t eschew discard effects should consider Giratina – that damage counter placement, while it has to target the Bench, becomes something of a delayed PlusPlower. It reminds me a bit of how Hypnotoxic Laser was used so widely while it was Standard legal. Oddly, the place where Giratina isn’t quite as good is the Limited Format. You’ll need two of three Energy being [P] to attack, the recoil is more dangerous here, and opportunities to use the Ability fewer. It is still a nice, relatively big Basic Pokémon, so most decks should try and work it in, anyway. Giratina could be a better card, but I’m not sure how without radically altering its purpose or defying typical card creation guidelines. I kid you not when I tell you Giratina might even be flirting with being broken; Distortion Door just does its thing a little TOO well. Yes, you cannot spam this Ability without Giratina hitting the discard pile over and over again, but 30 HP (and to a lesser extent, 40 HP) Basics have a sword of Damocles hanging over their heads. I am likely worrying without need, but then again, you know how much I love playing Night March in Expanded.